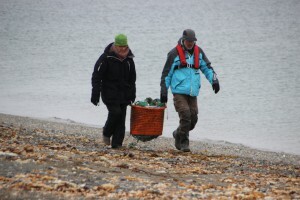 All who followed this blog know about it – during the last Arctic Season I carried out a Citizen Science Project on Spitsbergen about Anthropogenic Marine Litter, for the Alfred Wegener Institute Helmholtz Centre for Polar and Marine Research (AWI) in Bremerhaven. Lots of guests on our expedition cruises helped with the project, and we were able to collect and count lots of garbage. After return, we could now have a look at the data and make a first resume. But first of all, a big thank you goes out to all participants! You were great! The readiness of so many participants to help with cleaning, counting and weighing made it possible that we have now data from seven different beach cleanups in Spitsbergen and 18 transect monitorings at sea, from Norway up to Spitsbergen and around the islands. It also enabled us to learn about the specific challenges involved in high Arctic beach cleanups. As you all know, this was a test. We wanted to learn about the potentials of a Citizen Science Project about Marine Anthropogenic Litter. 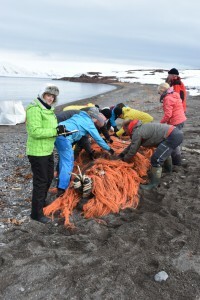 There are various beach cleanup schemes in Spitsbergen by now, but there has never been done a scientific data collection during these campaigns. What we did, was an absolute first – and we are very happy about all results! Last week I (Birgit) had a meeting with Melanie Bergman and Lars Gutow from AWI. During the last Arctic Season, they were on board of the German research icebreaker RV Polarstern, doing research about the level of litter and microplastic pollution in the deep sea (remember my lecture? J), sea water, snow and doing transects at sea. We had a look at our results and we discovered that we made very similar observations: The anthropogenic waste is not evenly distributed. Whether we found a large number during our monitoring or nothing. During our passage to the north, along the Norwegian coast and among some island groups, we encountered the highest amount of plastic litter close to cities or settlements. By contrast, when we were in ice, we hardly observed anylitter at all. The results from RV Polarstern and our results from SV Antigua, MV Plancius and SV Noorderlicht were quite consistent in this observation. Doing our beach cleanups, we observed that the pollution is not evenly spread across the archipelago. The northern areas seemed to be the most polluted, whilst in the southern Bell or Hornsund area, there was less litter on beaches. This might be the result of ocean currents. Additionally, we made another observation: Especially on some beaches which are more frequently visited by expedition cruise ships, there is almost no litter. 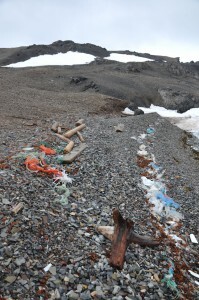 It appears as if there is a positive impact of tourism on the amount of litter on beaches in Spitsbergen. This is especially interesting as it contradicts observations from other regions, where usually the most frequented places are the most polluted ones. We sorted the collected garbage in different categories. 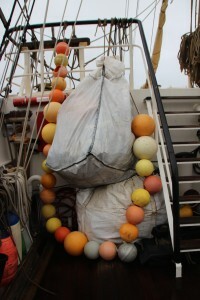 Result: Most of the garbage was plastic packaging (55,69 kg) and from fishing industry (927 kg). Please note: This is only the „scientifically“ collected and sorted garbage, which we collected in certain limited areas to obtain scientifically reliable data on the extent of pollution. The total amount of litter that all of you collected with us, just when going back to the ship or in addition to the beach cleanups, is a lot higher. Maarten van der Duijn Schouten, Captain of SV Antigua: ”I estimate that we collected during the three voyages on SV Antigua around 300 kg of garbage per voyage, plus the orange sea monster and the rope fender that weighed 800 kg alone. So, I guess it sums up to around 1,700 kg for these three voyages.“ Also on MV Plancius and on SV Noorderlicht we collected more material. Especially seen the large amount of fishing ropes that were collected, this is an invaluable help for animal life on Spitsbergen. Every fishing net may have saved one reindeer and every little piece of plastic may have saved one bird. The transect data will now be used for quantifying litter items at the sea surface, the buoyant part of pollution. The data will also be compared with those collected during three expeditions of RV Polarstern in summer 2016. Comparing these quantities with those from other regions, e.g. the North Sea we can assess how badly affected the Arctic surface waters are and if there are accumulation areas. With computer models from the AWI oceanography department, we will try and explain the distribution patterns that you observed. Data from the sea surface are also particularly important to evaluate the risk posed to bird life. For example, last year a study showed that 88% of the northern fulmars from Spitsbergen had eaten pieces of plastic. Currently, we do not know where 99% of the plastic entering our oceans actually are. The data from the sea surface can now be compared with pollution levels that we measured on the deep seafloor, to assess if the seafloor is a final sink for marine litter. The beach monitoring data will now be used for similar comparisons. After a preliminary check, it looks as if the quantities (8 – 43 kg per 100 m) are comparable with those reported, for example, from North Sea beaches (10 – 345 kg per 100 m). The data can be used as baselines. If we are to continue such surveys, this is the first point in a time series. Publication of the results in scientific journals and presentations will raise awareness to the fact that our pollution has spread so far to the North and that vulnerable Arctic wildlife is not only threatened by climate change but also by our litter (e.g. seals, birds, polar bears, reindeer). to be counted and to clean the beach completely. 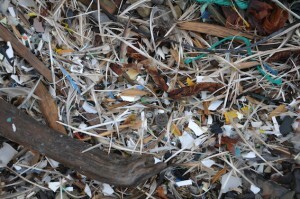 Often the plastic has fragmented into small pieces or even microplastic, which is impossible to pick up in a reasonable time frame, and even more difficult to count. Often the plastic has unified with natural products, and it is hard to disentagle the two. A lot of items are frozen / blocked in the ground and cannot be taken away. As we are doing these collections in the high Arctic, we have yet another challenge to face: The Polar Bear Danger. This involves a certain manpower for polar bear guarding, which is not always easy to provide during an expedition cruise without interfering with normal procedures. Manpower is also necessary for promoting the project on board, administrating the collected data and mail contacts and in the end to dispose the garbage upon return to Longyearbyen. This requires help and understanding not only from guests, but also from tour operator, expedition leader and team. Sometimes I was EL myself, and I am very thankful to the other expedition leaders and all team members who also contributed in the success of the project, especially Rolf Stange on SV Antigua and Christian Engelke on MV Plancius. They fully supported the project, as did Oceanwide Expeditions and Tallship Company. We plan to continue the project in the Arctic Season 2017. 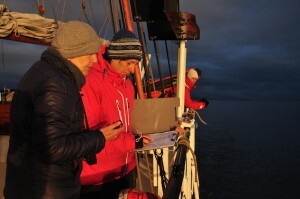 The transect monitoring proved to be easily doable during expedition cruises. The beach monitoring needs some adjustments. It seems we made a big effort with relatively small outcome and a comparatively small number of data. Mainly because of the large amount of garbage we encountered and the difficulties to collect and count all of it. After having seen the large amounts of litter and the difficulties to count all of it, we collected in a first meeting ideas of easier, faster methods which are still scientifically sound. We plan to develop new methods for the next season, enabling us to collect data during almost every landing and not only during the big cleanups. We will be working on that during the winter. Finally, we also want to find a better way for thanking all participants. We were very pleased to see the enthusiasm about the Arctic AWI-cups we could give to everybody on board of SV Antigua. It was logistically impossible to get these cups on board of MV Plancius and SV Noorderlicht, so those guests did not receive this pretty present. We will also improve these logistics, as we really want everybody to get a symbolic recognition and a memory of the project. For me personally, it was a great experience to carry out this project, and it continues to be great to make adjustments now. First, it is a great pleasure to work with Melanie and Lars from AWI, to learn from their vast knowledge in this field, and to pass on this knowledge to interested guests on the ships. Second, it is an invaluable experience to see the guest´s interest, enthusiasm and will to really do something, and how they do not hesitate to even carry really dirty garbage and fishing ropes and nets across long beaches. Sometimes I felt people were even happy to be able to do something. To witness this was a valuable experience I am deeply thankful for. Not only because it made the project possible. Also because it seems, not all hope about mankind is lost! I can only thank all participants and supporters and ask you again to spread this message, spread your experiences and continue to use less plastic and pick up plastic wherever you are. As we learnt, every little piece makes a difference. ← How do we want to live? AWI-project: Publication in Marine Pollution Bulletin! Kvitøya and 39 bears – good-bye SV Antigua! Copyright © 2019 Birgit Lutz – (eng). Powered by WordPress. Theme: Accelerate by ThemeGrill.